That must be a typo, there on the back inside cover that This is his debut novel assertion. No one could read THE CUTTING by James Hayman and come away believing this novel is his first. A fair mystery is a rare find in contemporary fiction, perhaps because a good one takes a bit more cleverness to construct than does a simple police procedural or courtroom drama. The traditional mystery plays fair with the reader by providing all the clues necessary to resolve the central problem of the story (such as, Who done it?) and by never engaging in true deception of the reader, who simply hadn’t noticed that the dog did not bark in the nighttime. An astute genre buff revels in the game of out-guessing the author and out-smarting the hero of the tale, enjoying the process of detecting equally whether he or she wins or loses the deduction game because the game itself was played fairly and well. Hayman relinquishes nothing of the flavor and veracity of today’s writing styles by adhering to the traditional rules of fairness and he delivers this amazingly cohesive entertainment with the skill of the virtuoso. He CANNOT be new at this. This work also must be acknowledged to be formula in that it adheres to a time-tested and beloved framework within which many thriller novels unfold: good cop from the city moves his career and his family to a supposedly safer and quieter venue, encounters blood-crazed killer(s) and agenda-crazed bureaucrats, becomes discouraged at the absence of clues/suspects/support from superiors, perseveres at great cost to himself, and vanquishes the perp(s) in the end. But the formula cannot and does not constrain Hayman’s apparent intention: to deliver a thoughtful and realistic depiction of a perfectly feasible criminal reign of terror that could happen only in the presence of modern medical and scientific advances. THE CUTTING respects yet transcends the formula in the same way that a grown child might remain true to its family roots while far outdistancing its parents in achievement, understanding, and contribution to a greater whole. Hayman’s interpretation of the formula gives us a prologue wherein an 8-year-old boy stands at the brink of socio-pathology and throws himself wholeheartedly into the abyss. The action in subsequent chapters tracks the efforts of Detective Sergeant Mike McCabe, a former NYPD cop now leading a detective squad in Portland, Maine, to identify and stop the killer into which that 8-year-old has morphed. McCabe also is anxious to succeed in his role of single father to a young girl abandoned by her selfish and immature mom. He is an exceptionally likeable protagonist, not a hero, exactly, but not a drunken mess, either, like so many modern-day fictional detectives. He is basically your average Good Joe, albeit with an eidetic (photographic) memory; he’s a great dad; two wonderful women are in love with him; and he has a good track record with the police department. He just has the misfortune to find himself up against a diabolical adversary who doesn’t even acknowledge the rules of human conduct, let alone play by them. Certain mistakes are common in early novels, and Hayman simply does not make them. His pace is fairly easy-going much of the time, accelerating as appropriate with intensified action in the plot, but generally reflective of the actual day-to-day workings of a detective squad. He places his action in Portland, Maine and surrounds, a place he knows well because he lives there. And although the setting is not necessarily critical to the story line, it is helpful in that it provides lots of opportunities for seclusion and hiding places for bodies, plus a wonderful juxtaposition to murder in the state’s slogan, The way life should be. Hayman re-grounds us in Maine periodically with his use of actual Maine locations and institutions (with some name changes) and his detailed references to Maine rural roads and interstates. He even casts a brilliant Somali as a civilian computer expert, a nod to the recent immigration to central Maine of many political refugees from that country. His main characters are well-developed through their behavior and dialogue with some background from a third-person narrator, who puts us in the enviable position of seeing most of the action while the characters see only select portions as the plot plays out. Not only is Hayman’s plot fair,â€ his writing itself is, too. Although the plot is intricate, he never once stoops to yanking dei out of machinis, but rather resolves plot conflicts with real facts ascertainable within the story. He calls on his protagonist’s eidetic memory only to the extent another author might rely on a character’s prodigious note-taking. He does not stretch his book with superfluous or repetitious action. He refuses to rely on gratuitous violence or unnecessary gutter talk to pad his plot or his characters. He gives us the fiery red herrings we crave in a mystery, but doesn’t actually misguide us that wouldn’t be fair! And he writes with great skill and subtlety, perhaps developed during his advertising career but nonetheless almost eerily perfect for fiction. Vignettes involving a hostage are set apart from the main story in a different type face. We get the occasional spritz of Yeats poetry, a mountain-climbing apologia, a little history to pace the plot and add depth to the characters. And Hayman delivers some wonderfully suspenseful moments: instead of writing He picked the lock and went in, Hayman spins out five lines of lock-conquering finesse that make us squirm. One assumes that Mr. Hayman’s talents must have flowered during his formative period, as he writes unselfconsciously, as naturally as breathing. Bottom line: James Hayman respects his readers, his craft, and his role as an author sufficiently to use our language correctly and vibrantly yet unobtrusively, allowing his readers a seamless experience of his tale. 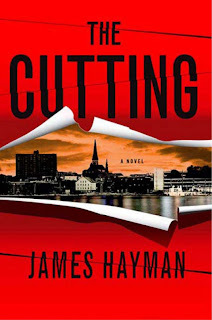 THE CUTTING is a thriller, not a morality tale, yet it is more than a story of cops, crime, danger, mayhem, and brilliant detection. In this novel, the lines between good and bad are clearly drawn. But the good, in particular McCabe, stands so far apart from the bad because, deep between the lines of the story, he always challenges himself: Am I good enough? Was that decision fair, that action ethical? Was breaking this rule justified? He does the best he can with the information at his disposal and the human traits he was born with, and he decides he will be satisfied with that level of imperfection, the ambiguity.In the end, we admire him greatly, and hope we, too, may be sufficiently comfortable with our own ambiguities to be effective in our lives. Hayman is as wise as he is talented. So: James Hayman? Sure, we believe you’re a new author. Whatever you say. Just give us more. Now. Please. A hearty Thank You! 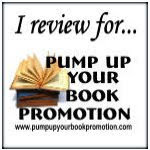  goes out to Minotaur Books and Pump Up Your Book Promotions for the opportunity to read and review this novel.